We use the Data Blending process when data is located into multiple databases. It is Horizontal merging it means Data bases are having different columns apart from common column for define the relationship. 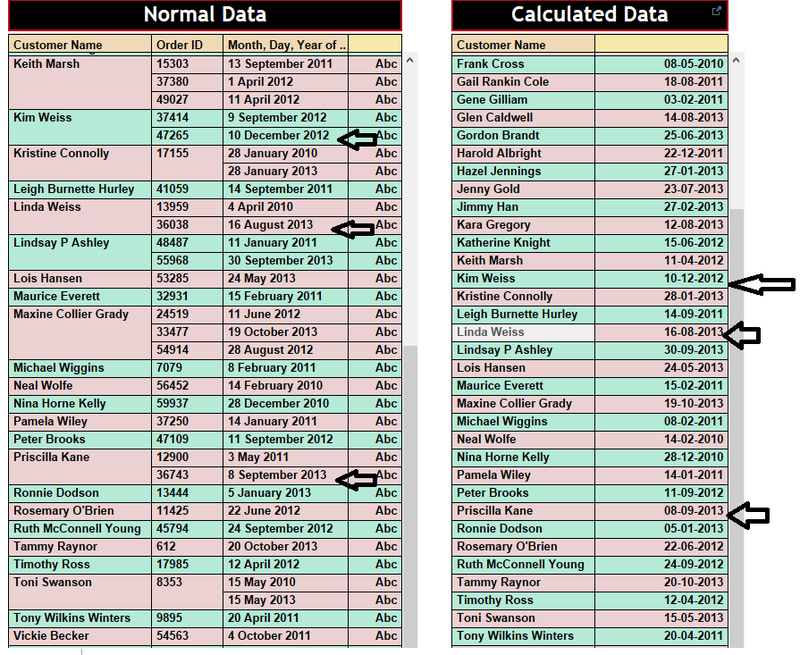 The following example illustrates, how to use the two data sources to build the Report. 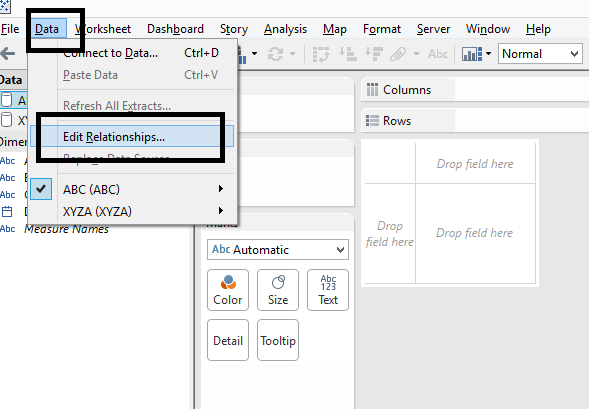 1) Connect the Tableau with "ABC" database, Then connect to Database "XYZA" by clicking on "Connect to database"
2) Once we connected to database 2, we have to define the relationship between 2 databases. Here Column "A" is common to define the Relationship. 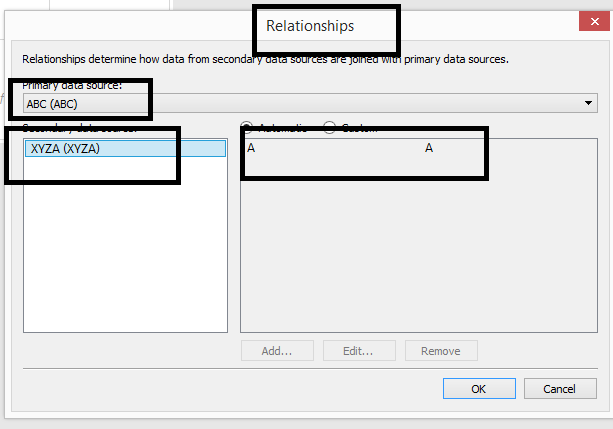 3) Click on Data on menu bar, Click on "Edit Relationship", Then Select Primary & secondary databases then define the relationship between those 2 databases. Now we can use 2 databases to build the reports.Once we define the Relationship between 2 databases, Primary Database will be highlighted inBlue, Secondary in Orange color. If relationship will be removed, then we get the nulls when use columns. Define proper relation between two databases. 1) If we don't define the relationship for blending purpose, it will show "*" symbols. 2) If we define the Relation, that "*" will be removed. 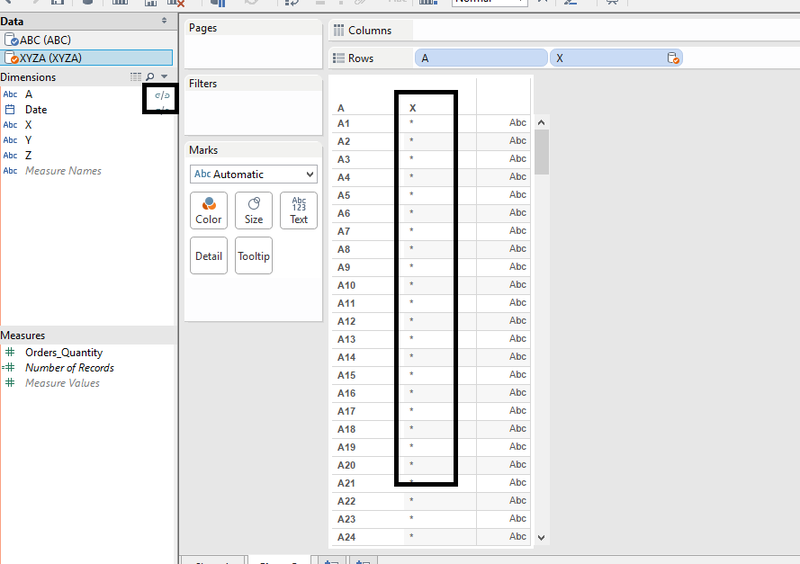 If any calculation using Both Data sources in the Calculation, we have to use that both columns in the view hence we can hide if don't want to show. After connected to Databases, I renamed as Database 1, Database 2. Then i have created a calculation using two data sources fields. If we use only 1 Column in the view even 2 are used to create calculation, it wont show the Data correctly since we are calling only 1 column from 1 DB onto View. If we use columns from both data sources, it won't pass error since we are calling two fields from two DB. Taking “X” from 1 data source, “C” from another data source. 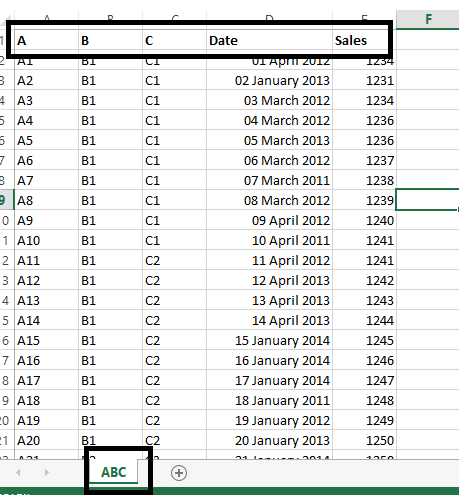 & I defined the relation (Blending) using common column “A”. If I drag "X", "C" then it will pass error. IF i use "X", "A", "C" then it won't pass error. 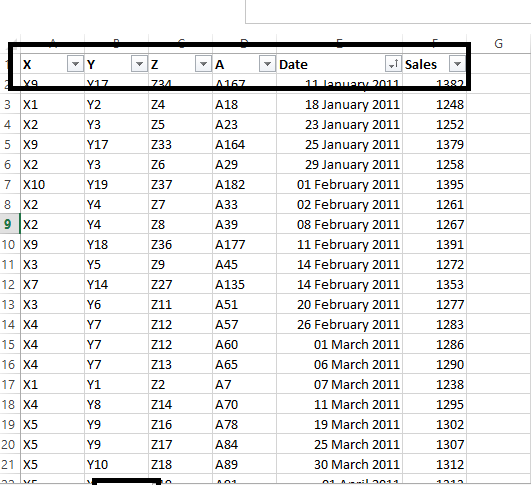 Here were getting null values for "Calculated" field since we are not using referenced column of two both data sources. Now there are null values since we are using referential column in the report, that is "A". 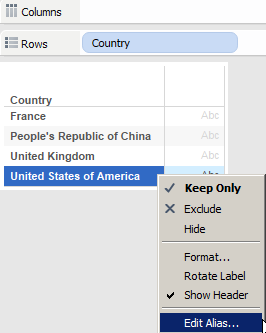 If we want to hide "A", then right click on "A" then click on "Show Header". 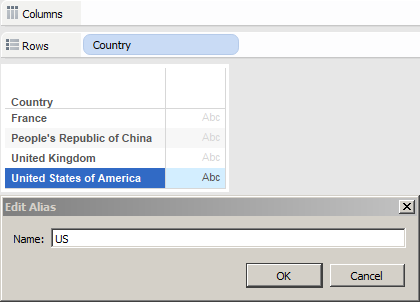 Country is the Common column to define the join between 2 database. 1) I connected to the DB1. 3) Now I defined DB1 as Primary, DB2 as Secondary. 4) If we drag Country from DB1, Country from DB2, DB1 Country shows all records & Only matched records from secondary data source . Here we can't show all records from DB1, DB2 (Means all 15 Country's data at a time). Means Full outer Join is not possible by doing the Data Blending. If we want to show all 15 countries data on the view, we go for custom SQL. Some times data in 2 databases may not having the same names ( Like USA in 1 Database , United States of America in another Database) , we have to edit the names & define the Aliases then it will match. 2.drag country to row shelf to get a list of countries. to match the target country name. The problem is the countries are in different notations: One is in short form, the other is in long form. How to blend them? Are they blendable at all? The answer is affirmative, not without a little twist though. I am listing two ways of doing it. Assume both data sources are connected. Using this newly created dimension [Country], you can blend with the other data source. 2. Add an alias to each country in the [Country] list of the second source. - make sure all the aliases are the corresponding names in the other table. Either of the above lays the ground for blending the two data sources. We are ready to blend. To blend naturally, rename the two country dimensions to be exactly the same. 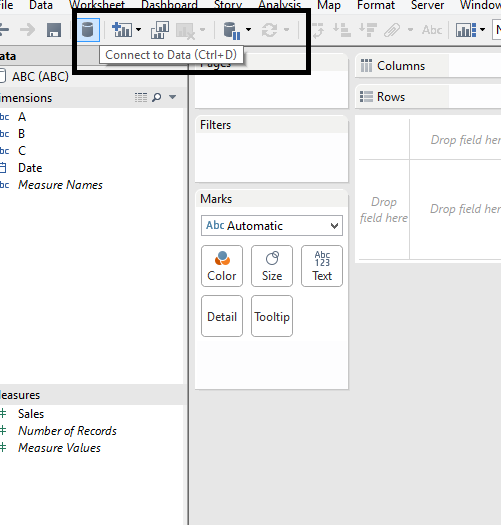 Tableau will try to link up the two dimensions automatically through intelligent guess. 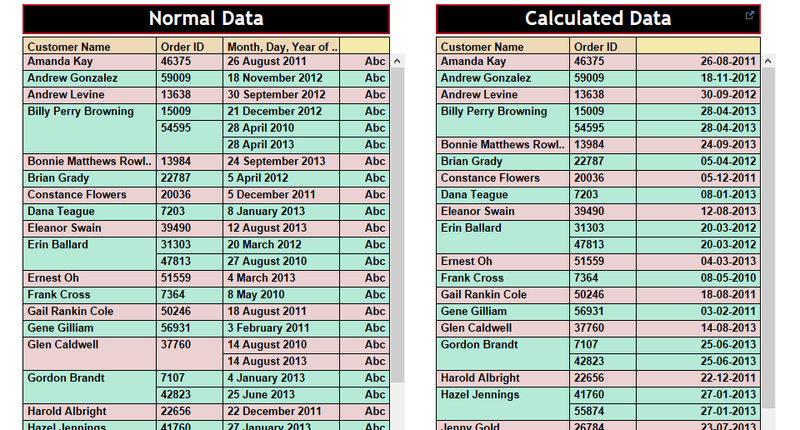 - link up the two dimensions there, using custom method to join the two data sources. Note that for some data sources such as published data extracts, you are not allowed to edit aliases. Quite a weird restriction. The workaround is to duplicate the dimension in question, and work on the duplicate. You may also right-click any dimension to edit the aliases for the whole filed. 1) If we implement Data Blending, Can't use the "Show Relevant Value option (Cascading Quick Filter), If we use Join then it easier. 2) If we implement Data Blending, We can't apply the Global Filter when different reports from Different Databases, If we use Join then it easier. 4) Measure Names, Measure Values does not appear in the Second Database, So Joining is better in the approach. 5) We can't apply the Action from 1 report to another in the Dashboard when different report are built using different Databases. We can add our customized Images to report. Create a new Folder in the Shapes Folder, then add your shapes. then Reload the Shapes in the view. Then Select the New folder which was created in previous steps. Then you can assign the Shapes accordingly. Now we can show New Shapes on the Report. Here I'm creating 2 reports , 1 is to show Normal Report, another 1 is to show Calculated Report. 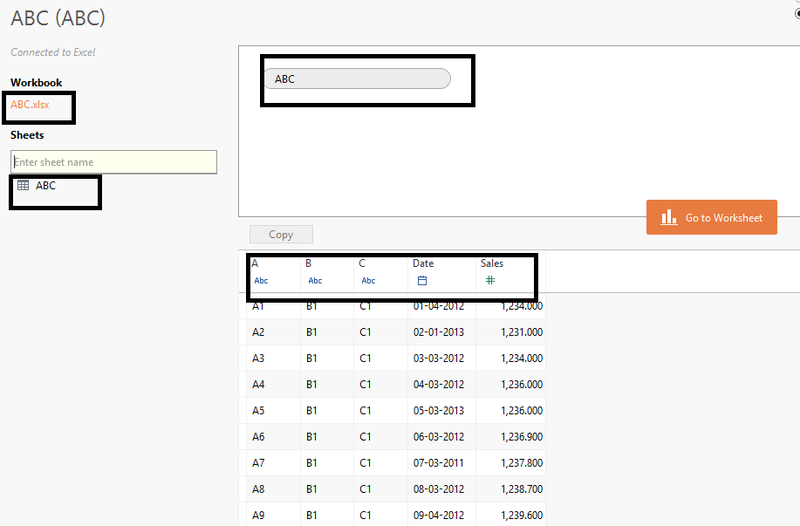 Hence adding those 2 reports to Dashboard, which will show Latest Order customer wise. 1) Create a Report using [Customer_Name], [Order_ID], [Order_Date]. Create a dashboard by dragging the above reports onto Dashboard. 1) Create a calculation like i commented on the first image. 2) Drag [Case Number], [Status] on to Row shelf. 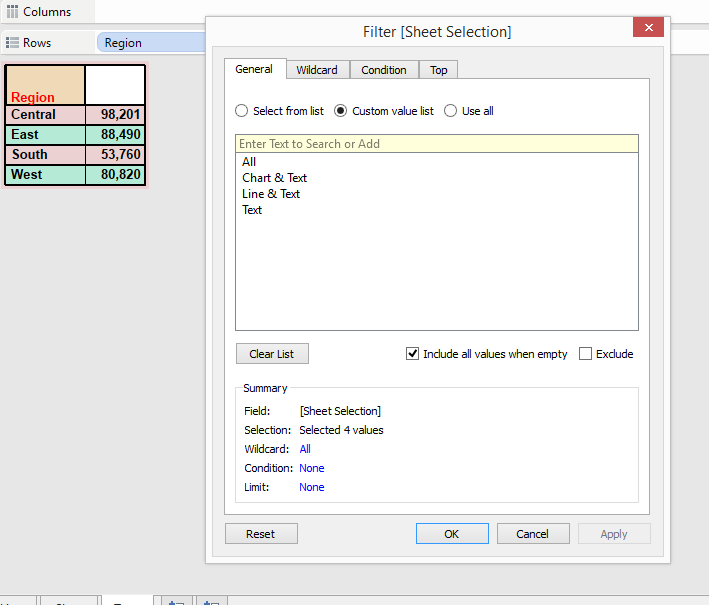 3) Drag "MAx" field onto Filters shelf, select "True". 4) Right click on "MAx" on Flters shelf, click on "Add table calculation". Now we will get your required result. Follow the Same steps like above apart from Calculation. Parameter: Parameters are variable, which are used to pass the values dynamically to the view. An example of using Parameter is "Dynamically Selecting Measure & Dimension values in the View. 1) Create a Parameter for Dimension Selection purpose "Dimension Parameter", By using this Parameter, we can select the Dimension Value (Field) dynamically. 2) Create a Parameter for Measure Selection purpose "Measure Parameter", By using this Parameter, we can select the Measure Value (Field) dynamically. 3) Create a Calculated Field for Dimension Selection using the syntax in the image. 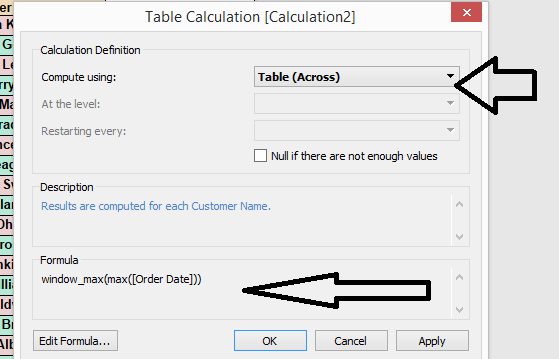 4) Create another calculated field for Measure Selection like below image. The following example explains when measures located on two databases. Then Place two measures on the Report like below image.Then you can define different marks for both measures. We use the Parameter to select the Sheet or Sheets dynamically on the Dashboard. 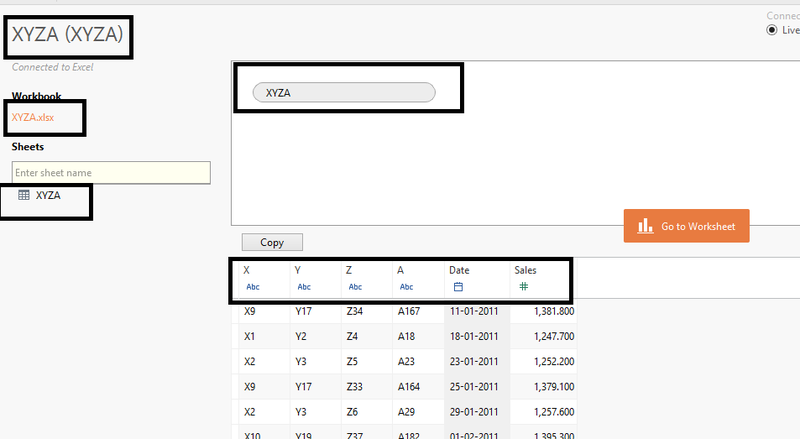 1) Create 3 Reports Individually. 2) Create a Parameter, here Values are defined as per our requirement. 3) Create a Calculated Field, which used to define the values which we can select from Parameter. 4) Drag "Sheet Selection" calculated field & define the values, if we select any one of these values then we will get this sheet on the Dashboard. 5) Similarly, we can define the values for sheets "Text", Line"
6) Now add all 3 reports to Dashboard. Now we can select the Sheets according to requirement.